Christopher Rea is Associate Professor of Asian Studies at the University of British Columbia. Timothy Brook is Republic of China Chair and Professor of History at the University of British Columbia. 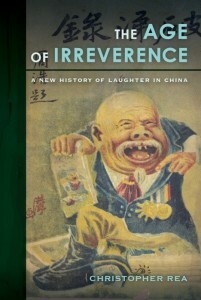 China’s entry in modernity was not just traumatic, but uproarious. As its last dynasty fell, political discussion erupted into invective, with critics gleefully jeering rivals in public. Farceurs drew followings in the popular press, promoting a culture of buffoonery. These expressions of hilarity proved so offensive to high-brow writers that they launched a campaign to displace old forms of mirth with a new one they called youmo (humor). What can we learn about history from those who laugh their way through it? Focusing on the case of China, this conversation will discuss how political turmoil, new media, and other forces have nurtured cultures of humor in a modernizing society, from the last days of empire to the digital age. Co-sponsored by UBC’s Peter Wall Institute for Advanced Studies, Centre for Chinese Research, and Department of Asian Studies.